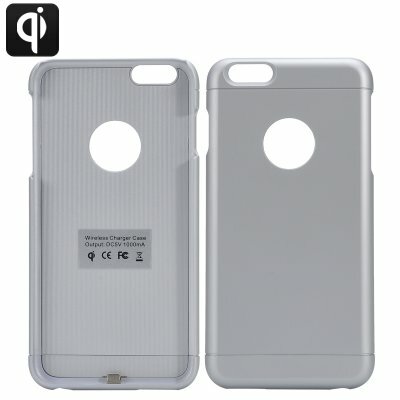 Successfully Added iPhone 6 Plus Qi Wireless Charging Case - WPC 1.1.2 Compliant, Tough PC + ABS Case (Silver) to your Shopping Cart. This PC and Plastic phone case will bring Qi charging functionality and a high level of protection to your iPhone 6 plus. Don't be disappointed that apple didn't put Qi charging as standard on the iPhone 6 Plus, buy this Qi charging case and enjoy the benefits of wire free charging. Specifically designed to accommodate the 5.5 inch iPhone 6 Plus this Qi wireless charging case fits like a glove and brings a high level of protection thanks to its flexible yet tough PC and ABS composition. Its full compliant with the World Power Consortium (WPC) 1.1.2 standards so you are guaranteed compatibility with the vast majority of wireless charges as the WPC standard is the globally recognized leader in wireless charging and incorporates backward compatibility so no matter how fast the technology progresses this case will continue to be supported. The case has been finished in the same silver color as many iPhones and has a thin compact design so you will hardly notice it’s there. Like all the best tech gadgets it brings superb functionality without compromising any of the features of you iPhone and to top it off it looks great as well. The inductive charging technology delivers 5 Watts of charging current to your phone so it can quickly and effectively charge without the need for messy wires or wear and tear on the phones lightening port.